Pronology, a developer of cutting-edge tapeless workflow solutions, is introducing Screener™, a multi-channel, file-based production screening device that records universally playable MP4 files, at the 2017 NAB Show (Booth SL11807). Specifically aimed at directors, producers and other industry professionals working in studio, mobile, sporting and a variety of other environments, Screener replaces legacy DVD recorders that have been traditionally used for screening and offers a wealth of additional features that are useful for modern production. Creating universally playable MP4 files, Screener is unique in that it is not solely a screening device. It can also visually watermark with text or graphics, record a timecode overlay, run on a standard PC or other off-the-shelf hardware, and offers multiple channels per installation. It allows for HD-SDI playback functionality in multiple resolutions and can create sub-clips. This allows operators to extract timecode-specific portions of a recording that can easily be viewed as well as securely shared for review and approval. Screener enables users to easily copy clips to network storage paths and removable storage devices, primarily USB 3 thumbdrives. Other features include mobile device support, HD or SD input options and it allows users to internally add burn-in timecode from an external LTC source. 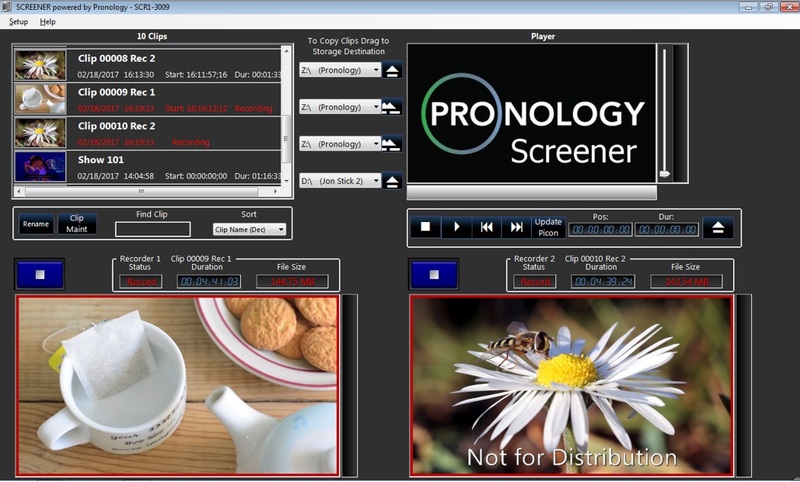 While Screener is based on the same basic architecture as mRes™, Pronology’s advanced encoder that can record three tiers of video per input channel and provide various file formats, Screener is a scaled-down version specifically designed to accommodate MP4 files for low-res viewing/screening applications.